Emerging from cognitive behavioural traditions, mindfulness and acceptance-based therapies hold promise as new evidence-based approaches for helping people distressed by the symptoms of psychosis. These therapies emphasise changing the relationship with unusual and troublesome experiences through cultivating experiential openness, awareness, and engagement in actions based on personal values. 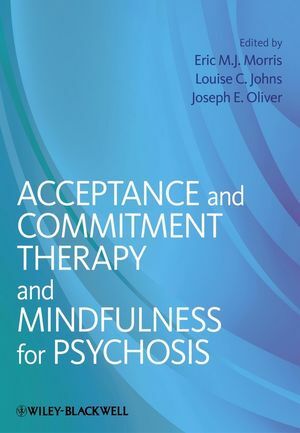 In this volume, leading international researchers and clinicians describe the major treatment models and research background of Acceptance and Commitment Therapy (ACT) and Person-Based Cognitive Therapy (PBCT), as well as the use of mindfulness, in individual and group therapeutic contexts. The book contains discrete chapters on developing experiential interventions for voices and paranoia, conducting assessment and case formulation, and a discussion of ways to work with spirituality from a metacognitive standpoint. Further chapters provide details of how clients view their experiences of ACT and PBCT, as well as offering clear protocols based on clinical practice. This practical and informative book will be of use to clinicians and researchers interested in understanding and implementing ACT and mindfulness interventions for people with psychosis. Eric M. J. Morris is a chartered consultant clinical psychologist and the psychology lead for early intervention for psychosis at the South London and Maudsley NHS Foundation Trust, UK. Eric has been practising Acceptance and Commitment Therapy (ACT) for more than ten years, and researches mindfulness and acceptance interventions for psychosis at the Institute of Psychiatry, King’s College London. Eric is a highly experienced trainer and supervisor in contextual cognitive behavioural therapies. Louise C. Johns is a chartered consultant clinical psychologist and coordinator of a specialist clinical service at the Maudsley Hospital, London, UK, offering psychological interventions for outpatients with psychosis. She is also an honorary lecturer at the Institute of Psychiatry, King’s College London. Since qualifying as a clinical psychologist in 1998, she has worked in a clinical and research capacity in the field of psychosis. She has published over 50 articles on psychosis, covering development and psychopathology of symptoms, and cognitive behavioural treatments. She has led on the first UK funded studies to evaluate ACT for psychosis in group settings. Joseph E. Oliver is a clinical psychologist currently working in an early intervention programme for psychosis in South London, UK. He is also co-director of Contextual Consulting, an ACT based consultancy, offering contextual-CBT training, supervision and therapy. In addition to teaching and research supervision at King’s College London’s Institute of Psychiatry, he has active research interests in the use of ACT for psychosis, in group contexts and in its potential to enhance workplace well-being.